Wow Patty, they are so cute and wonderful!! The most adorable group of mini babies that I ever saw. They are heart melting! Patty , your babies are all lovely and when you have 5 of them in your hand, they are plain irresistible! Ademas de ser unos bebes preciosos, van de maravilla en las casitas 1 /12. Patty, they are so so tiny and cute!!! How can you make such lovely and so mini babies!!! That is truly a sight to behold! They are just adorable. How you work on such tiny little pieces is astounding. Especially considering that each baby infused with such personality and so life like. Their eyes are always so beautiful. 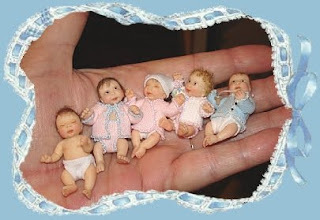 It is so cute to see all these babies in your hand. wow...this is just AMAZING!! so precious! Thank you so much for visiting my blog:) Yours is wonderful, I added myself as a follower and can't wait to browse through all your gorgeous little treasures! Patty, these tiny babies are so cute! And all their clothes are so realistic too! You do an amazing job! Patty, son todos perfectos, hermosos, dulces. ¡Por Dios!! tan pequeños y hermosos!! !